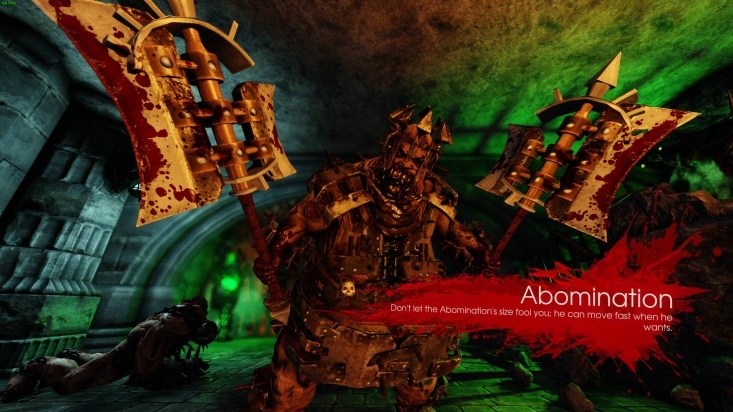 The Abomination is one of the four bosses faced at the end of a standard Killing Floor 2 survival game. 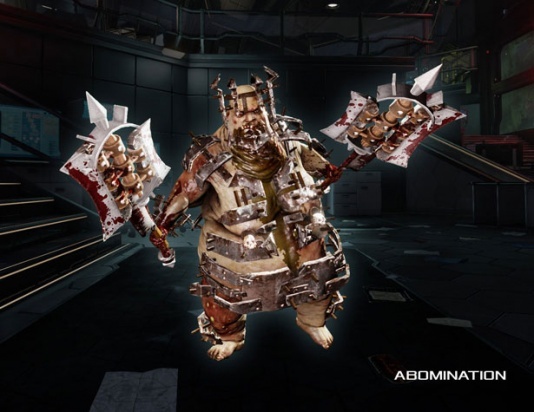 It is a taller and stronger version of its normal counterpart that also wears armor, spawns walking bomb a like minions named Abomination Spawns and uses unique "Gorge" attack that pulls players toward it. Just like the other bosses, Abomination has significant amount of the health which scales up with the additional players. At 6 man HOE server Abomination has total of 28350 HP and up to 25210 shield HP divided between 3 armor pieces. Abomination wears 3 pieces of armor - on its head, torso and spine. Each armor piece has its own HP scale and absorbs ALL the damage dealt to respective body part. Abomination enrages (duration - 9s) each time the piece of armor destroyed. Armor has same resistances as body. Note that Abomination does not have a head health and cannot be decapitated. Additionally, until destoyed, armor absorbs all the damage toward respective body parts. Abomination have only one weak spot, which is the head. Its arms / axes deflect attacks. Abomination resists to every form of the damage except Freeze and Ballistic Shell impacts (such as direct hits from the RPG-7 or M203 projectiles) which they are neutral to. It does not take any damage from its own Fart attacks. However, it does take 25% damage of it in Solo games, where ZEDs are more vulnerable to damage types that they resist naturally. Abomination has no weaknesses to ballistic weaponry. 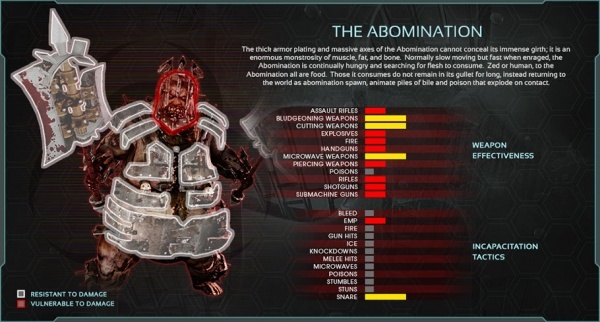 Abomination mostly uses the same attacks as a normal Bloat as well as some new, unique ones - within constant intervals it perfoms an AOE fart attacks which have nearly the same effect as on-death explosion of the Elite Crawler. Every fart attack also spawns an Abomination Spawn, the generic "poop"-looking monster that moves toward players at medium-to-high speed and explodes into the shower of toxic acid within certain vicinity. Abomination also tries to pull players toward it, such attack named "Gorge" - dragged player being completely immobilized akin to Vortex Attack of the PvP Siren, slowly moves towards Abomination and then takes moderate bite damage. Gorge attack is also capable on instant killing every kind of ZED on its way. On top of than nearly all non-melee attacks of the Abomination spawn the puke mines along the regular bloat bile. Puke Mines are the small ground laying bombs that explode when stepped on. Fart attack time is the random value that depend on the game difficulty and Abomination's health percentage, it also have some variance. This value and its variance changes lenearly from Y (when at 100% HP) to X (when at 0% HP). Fart Attack Timers (Normal) = (X=5.0,Y=9.0), Variance = (X=3.0,Y=4.0). Fart Attack Timers (Hard) = (X=4.5,Y=8.5), Variance = (X=2.5,Y=3.5). Fart Attack Timers (Suicidal) = (X=4.0,Y=8.0), Variance = (X=2.0,Y=3.0). Fart Attack Timers (HOE) = (X=4.0,Y=7.0), Variance = (X=2.0,Y=3.0). Rage Fart Attack Timers (Normal) = (X=1.75,Y=2.5), Variance = (X=1.65,Y=2.1). Rage Fart Attack Timers (Hard) = (X=1.25,Y=2.0), Variance = (X=1.15,Y=1.6). Rage Fart Attack Timers (Suicidal) = (X=0.75,Y=1.5), Variance = (X=0.65,Y=1.1). Rage Fart Attack Timers (HOE) = (X=0.75,Y=1.5), Variance = (X=0.65,Y=1.1). For every rage fart Abominations spawns one puke mine. It also adds one Abomination Spawn into the spawn pending list so they keep spawning after rage (interval - 2s). Gorge Attack Cooldown (per difficulty, changes linearly from Y=100% HP to X=0% HP): (X=8.0,Y=11.0) / (X=6.0,Y=9.0) / (X=5.0,Y=8.0) / (X=4.0,Y=7.0). Gorge attack animation lasts for 3.25s and has effective radius of 700 units. Abomination moves x1.62 times faster when enraged. Should sprint when enraged (either at 75% / 50% / 20% HP mark or due to armor loss). Also sprint within range of 5-25 meters from players starting from only 5m at the full health and ending up with the sprint range of 25m when it almost dead (i.e. range increases linearly). 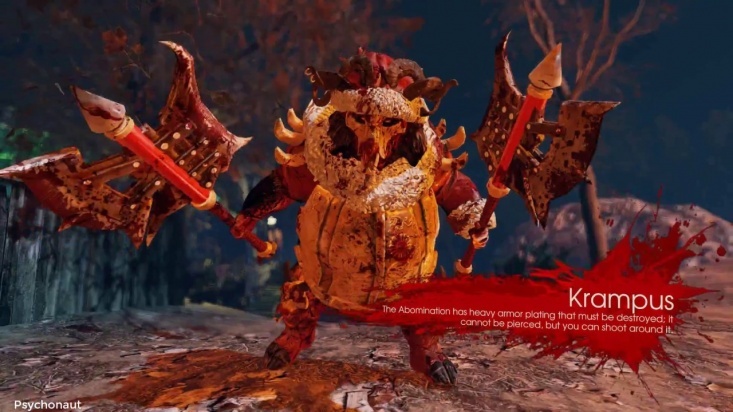 Abomination does not really have any battle phases, however it become more aggressive when lose health - the less health it has the more frequently it fasts and uses Gorge attack as well as it start sprinting from the greater distances from players. Additionally for every armor piece loss (head, torso or spine) or upon reaching 75% / 50% / 20% health marks, Abomination will become enraged for total of 9 seconds. Enraged Abomination charges at players at high speed and has extemely short time intervals between fart attacks / minion spawns. 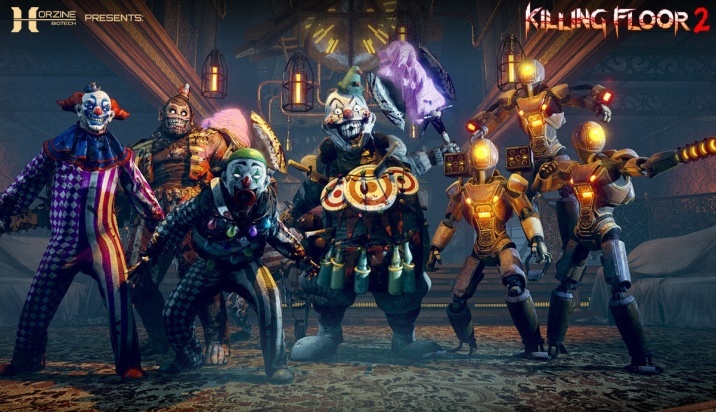 Minions (Cysts, Slashers and Alpha Clots) constantly spawn during the boss wave. Sprint delay, on loosing the LOS to players - 5s. For every armor piece loss (head, torso, spine) or upon reaching 75% / 50% / 20% HP marks, Abomination become enraged for a total of 9s. Armor has same resistances as body.Time between two Abomination Spawn spawns (if there are some in the pending list) - 2s. 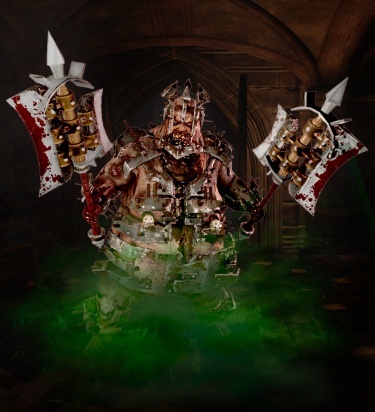 Nearly all non-melee attacks spawn the puke mines along the regular bloat bile. Maximum distance from player to initiate the Gorge attack and maximum Gorge range - 5.92m, for ZEDs - 7m. Pull speed - 300 units / second. Animation duration - 3.25s. Gorge Attack Cooldown (per difficulty, changes linearly from Y=100% HP to X=0% HP): (X=8.0,Y=11.0) / (X=6.0,Y=9.0) / (X=5.0,Y=8.0) / (X=4.0,Y=7.0). Minimum interval - 5s. Gorge Attack does not affect other bosses and Abomination Spawns. Damage to doors = 440 / 550. ZED mass = 400, Maximum falling velocity, units / second = 4000. Abomination Spawn evade chances, per difficulty - 0.1 / 0.4 / 1 / 1. Health loss percentage to trigger block: all difficulties - 0.01. Chance to block after taking damage: Normal - 0, Hard - 0.1, Suicidal - 0.85, HOE - 0.85. Health loss percentage to trigger block: all difficulties - 0.1. Block chains (max): Hard - 4, Suicidal - 5, HOE - 8. Block duration - 1.25s, cooldown - 3.5s. 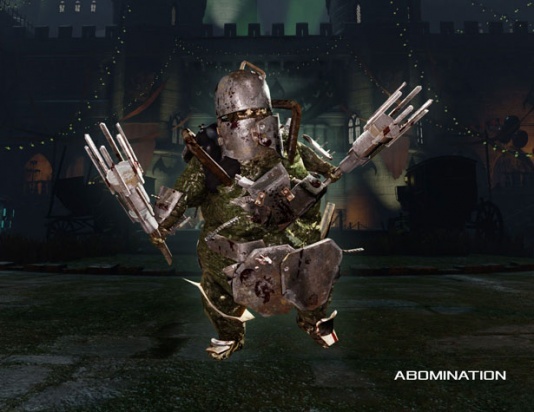 Abomination wears 3 pieces of armor - on its head, torso and spine. Each armor piece has its own health that absorbs ALL the damage dealt to respective body part. AOE attacks (e.g. fire, explosives) have their damage split across all existing armor pieces for equal parts. Abomination (much like other bosses) has an ability to destroy closed unwelded doors just by running into them.